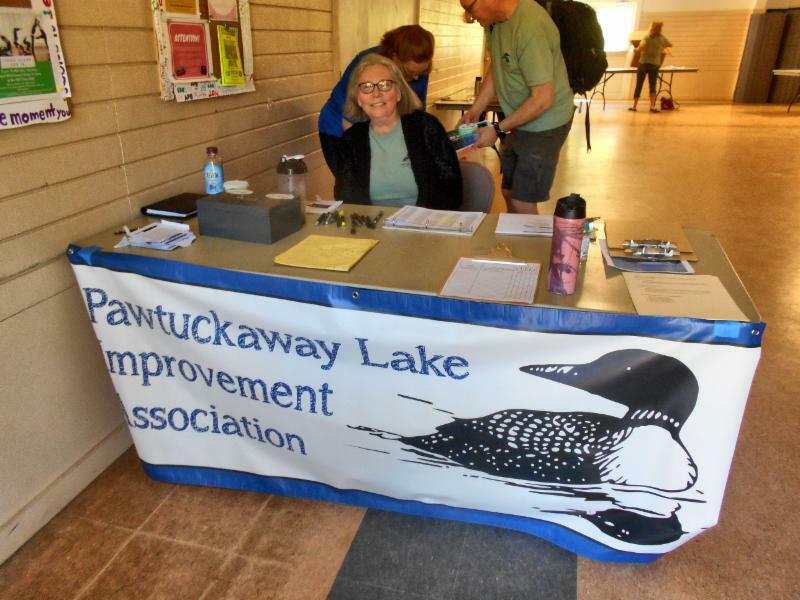 Amy Smagula, Chief Limnologist/Exotic Species Program Coordinator at NH Department of Environmental Services, has been working closely with the PLIA to identify, detect, and control aquatic invasive species in and around Pawtuckaway Lake. The slideshow presentation she has given at trainings is now available for all to view at the following link: PLIA Smagula Presentation 2018 We strongly recommend that anyone interested in the health of Pawtuckaway take a moment to learn about invasive species, especially milfoil! 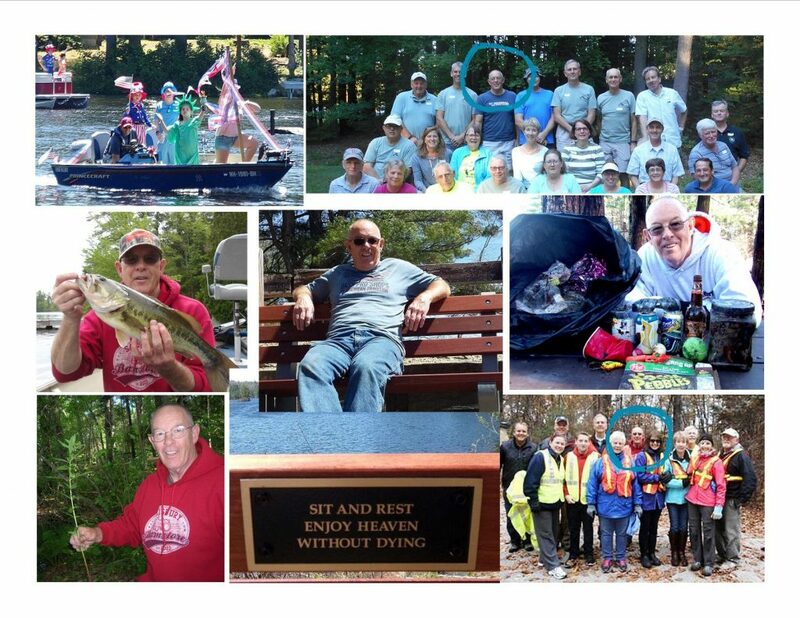 Don Roberge, Pawtuckaway camper, fisherman, and volunteer extraordinaire was chosen to receive the PLIA Local Hero Award at this year’s Annual Meeting of the PLIA. He was celebrated for his extraordinary efforts to conserve, protect, and improve Pawtuckaway Lake, largely from the campgrounds of the State Park where he loves to pitch his tent throughout the season. Although he is a resident of Manchester, Don has long been a fan of the lake and spends countless hours enjoying its beauty from his campsite and on his boat. He has volunteered with the PLIA’s Weed Watchers, has joined the crew on road cleanup days, and has stayed into the fall to help clean up the island trash that gets exposed when the lake level is lowered. He decorates his boat for the PLIA Fourth of July Boat Parade and recently even donated a bench to the State Park near his favorite campsite. It is situated specifically to watch the glorious sunsets from the North Channel, and Don recommends it for that purpose. But he also invites the public to rest and relax while their senses take in the beauty of the lake and its wildlife. Thank you, Don, for all you do! Come at 8:30 AM so you can check out our raffle prizes and buy tickets–ten different community businesses have made donations. Enjoy coffee and refreshments while you meet and greet friends and neighbors. Become a PLIA member, renew your membership, sign up for news updates, and discover our many volunteer opportunities. Find out who has been chosen as PLIA Local Hero of 2017. See what your PLIA has been busy doing and what it plans for the future. 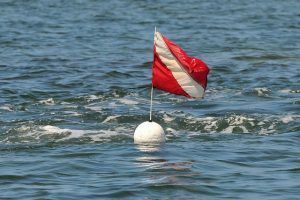 Shoreland Protection Act–how does it affect you? Leave a comment on Are You Ready for Annual Meeting? Leave a comment on PLIA Annual Meeting Coming! The PLIA has published a second edition of its newsletter. This one is dedicated to our Annual Meeting coming on May 19, 2018. You can read the full edition, and find out what we have planned for everyone this year, here. 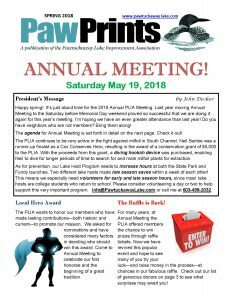 The PLIA recently mailed out its newsletter with an early edition to say ‘Thank You‘ to all its members and volunteers. You can read an electronic version–in color–here. 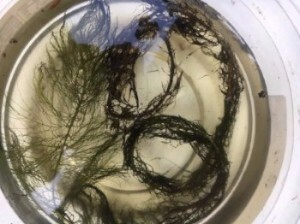 “The PLIA has been working very hard during the past few years to help control the infestation of milfoil in Pawtuckaway Lake—thank goodness a Lake Host was at the NH Fish and Game Fundy Access site on October 1 to prevent this piece of milfoil from hitchhiking into the lake. Had a Lake Host not been at the ramp at the time, it’s possible that all the time and money the PLIA and its partners have spent over the past few years trying to control the milfoil growth in the lake would have been in vain! In addition, milfoil was also discovered on its way into the Fundy and removed in late September, so our gratitude goes to these wonderful Lake Hosts – both paid and volunteer – for making this program such a success. Remember, spread the word, not the milfoil! Twice a year, PLIA volunteers gather to spend an hour fanning out along both sides of Route 156 between the signs bearing our name on them. 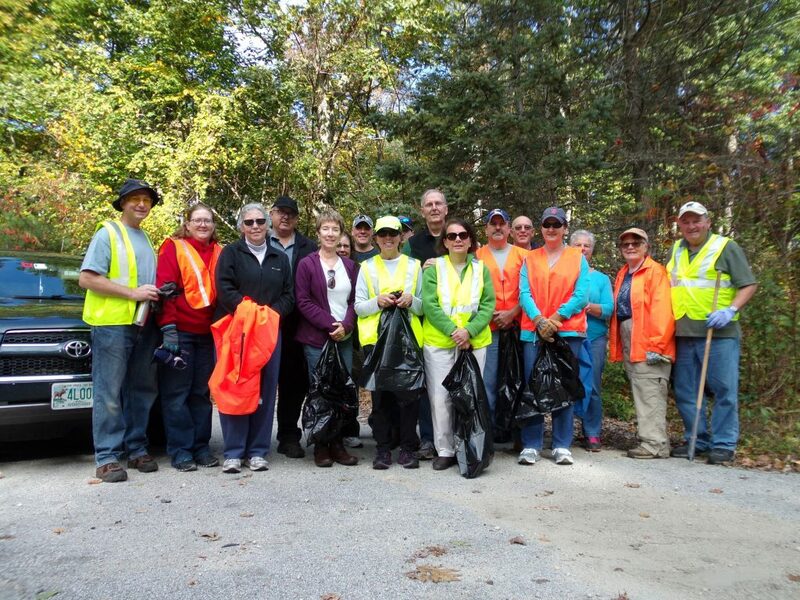 Spring and fall, volunteers in reflector vests scan the roadside, collecting and bagging trash. It is a program of which the PLIA is very proud, and is one way we are able to give back to the community. Plus, believe it or not, we have fun in the process! On Saturday, October 14, the PLIA had the biggest turnout ever for trash pickup along the highway! Truly a perfect example of the adage, “many hands make light work”. We had the entire strip of highway under our responsibility clean in record time and had a nice visit with friends and neighbors at the same time. ONLY FIVE MORE DAYS TO VOTE FOR $5,000! The Cox Conserves Heroes Award, in recognition of the volunteer work that Neil Santos has been doing to search for variable milfoil in Pawtuckaway Lake, has already benefitted the PLIA with a $5,000 grant. This is your chance to vote for Neil and increase the chances of an additional $5,000 award if he gets more votes than the other two finalists in this program. Please act now to register you vote at this website. Click on the VOTE button under Neil’s picture that links to the form for voting. Tell your friends, neighbors, and colleagues about this wonderful opportunity to fund milfoil control activities on Pawtuckaway and to preserve it for recreational enjoyment and wildlife habitat in many years to come. Voting ends on September 25th, so don’t put off this important and beneficial chance to speak up for conservation. Your vote counts! 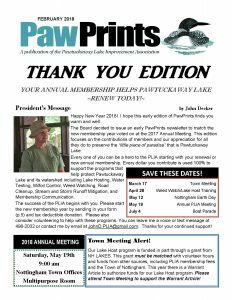 The PLIA thanks you and Pawtuckaway Lake thanks you! Leave a comment on ONLY FIVE MORE DAYS TO VOTE FOR $5,000!